Japanese brokerage Nomura says “healthy” visitor ramp-up and core revenue growth at Resorts World Genting – Malaysia’s only legal casino operation – should “remain resilient” in full calendar year 2019. The brokerage stated in a Monday note it expected the property’s operator, Genting Malaysia Bhd, to post revenue growth of 8 percent for this year. 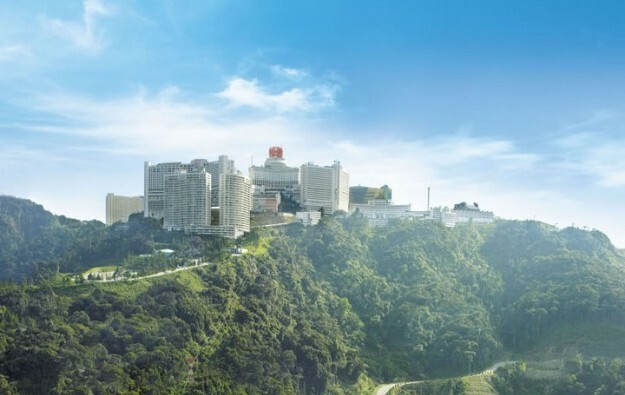 “We expect Genting Malaysia’s next leg of growth to come from its capex in Malaysia, which is a growing cash cow for the company and has boosted visitation and revenues,” wrote analysts Tushar Mohata and Alpa Aggarwal. In November the Malaysian government budget plan said the casino licence fee paid by Genting Malaysia for its Resorts World Genting facility was being be increased from MYR120 million (US$29.2 million) to MYR150 million per year, while the casino duty rate was to be raised to 35 percent from 25 percent of gross gaming revenue. The authorities also said gaming machine duties were being increased from 20 percent to 30 percent on gross collection. Resorts World Genting (pictured in a file photo) was expected to open this year a Fox-branded, Hollywood-focused, theme park, but the facility is now the centre of a legal battle in the United States courts. The park was to be a central part of the revamp of Resorts World Genting, launched in December 2013. Last week it emerged that Genting Malaysia had applied for a judicial review against another Malaysian government decision it considers harms its interests. It concerns what the casino business said was a delay to some promised tax incentives for its multi-billion-dollar revamp plan for the complex. There were positive factors that could help drive results at Resorts World Genting, the Nomura analysts said in their Monday note. “The indoor theme park (Skytropolis Funland) has officially started operations with 13 out of 21 planned rides, and we believe this should boost visitation,” they stated. Nomura now expects Genting Malaysia to deliver net profit of MYR1.27 billion in 2019, reverting an expected loss of approximately MYR450 million for full calendar year 2018. EBITDA for this year should however go down 9 percent in year-on-year terms.